The stamps are all masked together and I love how this little scene turned out. 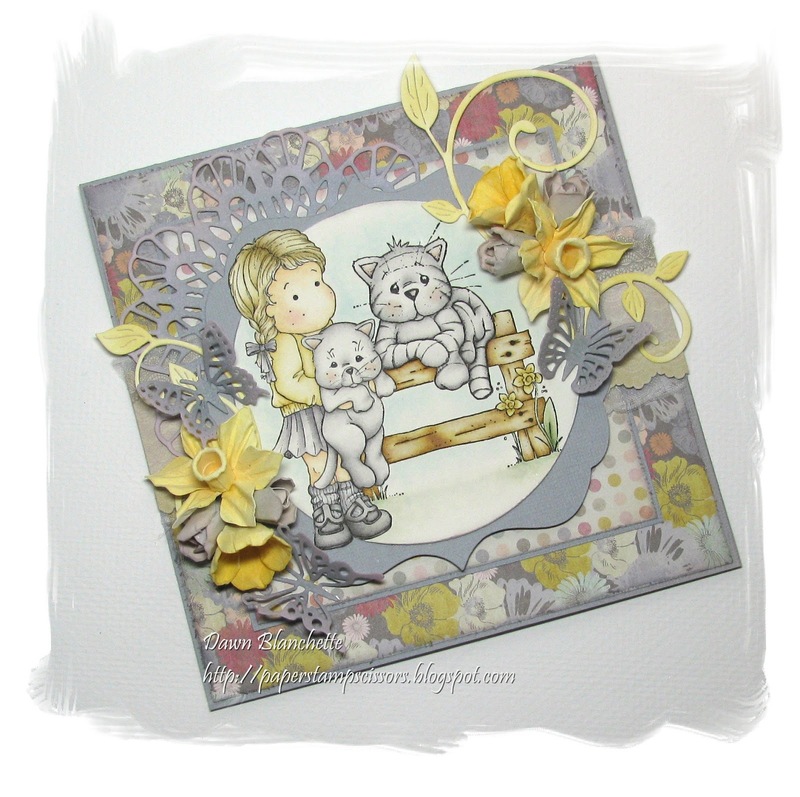 Daffodils and little baby kittens always make me think of spring! The flowers are all hand made - my attempt at daffodils, tulips and simple poppies. I like how they turned out, but next time I would change the tulips just a bit. I'll do a tutorial on the tulips and poppies in another post later on to keep the size of this one down:). 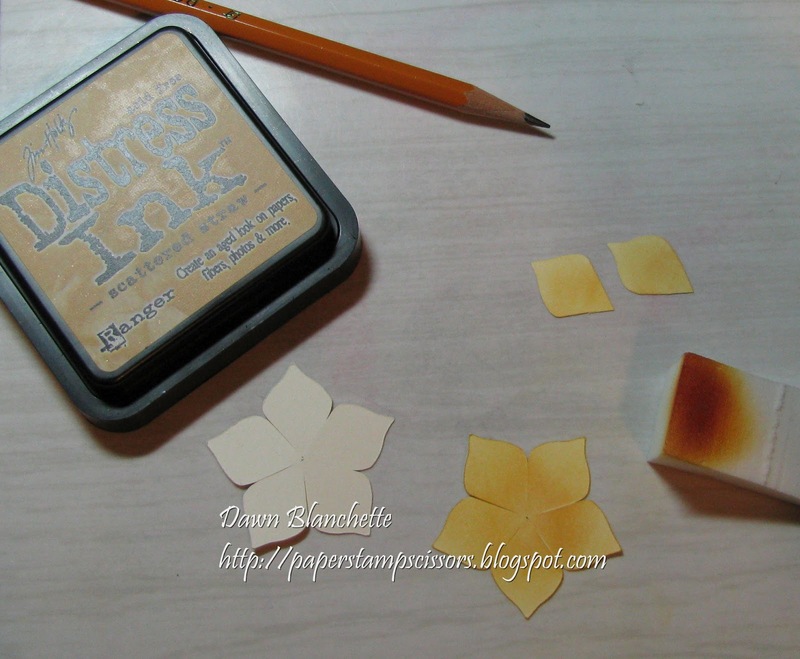 Scroll down to the end of the post for the daffodil tutorial. Ink - Image stamped with black stazon, coloured with Distress inks - antique linen, frayed burlap, scattered straw, black soot, weathered wood, milled lavender, vintage photo, tattered rose, bundled sage and tumbled glass. Papers inked with milled lavender and weathered wood, flowers and die cuts coloured with scattered straw, wild honey, weathered wood and milled lavender. 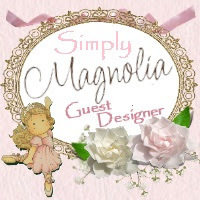 Magnolia-licious Highlights - Feb DT blog hop 'Spring is Right Around the Corner.' 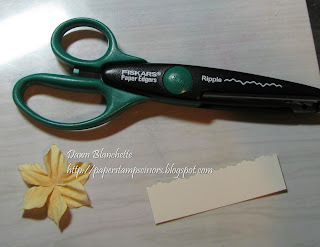 This is where I got the inspiration to make my own daffodils - Patti Jo used punches to make her own and they are gorgeous! You can check them out here. 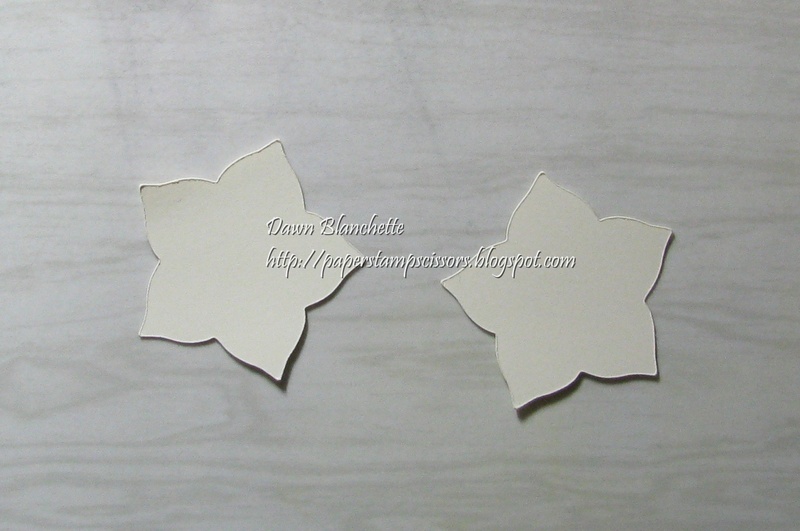 I started with a star shaped flower - this one is on the Straight from the nest cricut cartridge. 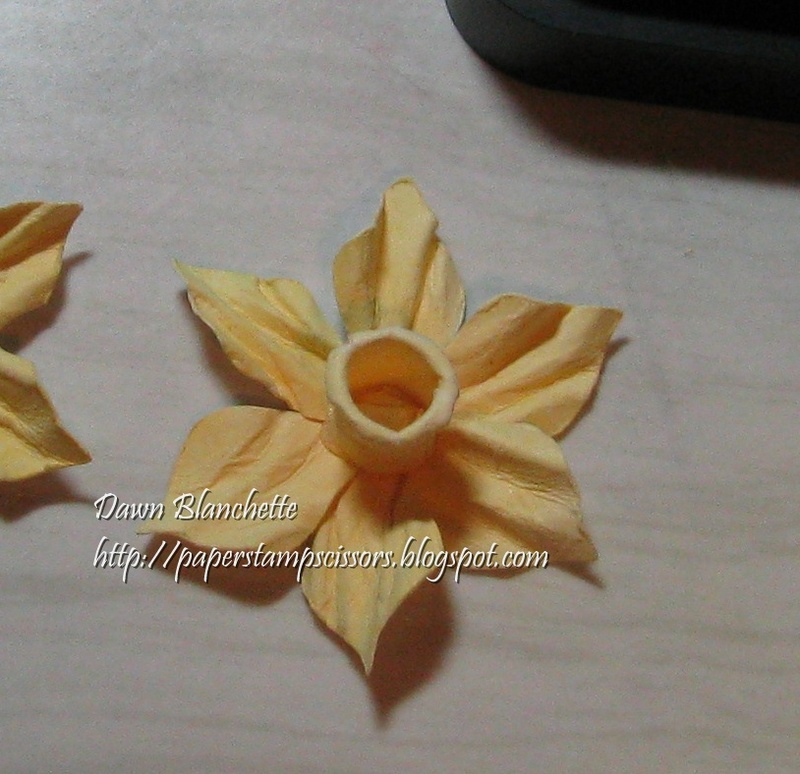 I cut an extra one as these particular flowers only have 5 petals and daffodils have 6, so I needed to borrow an extra petal. This also makes for a flower with fuller petals. 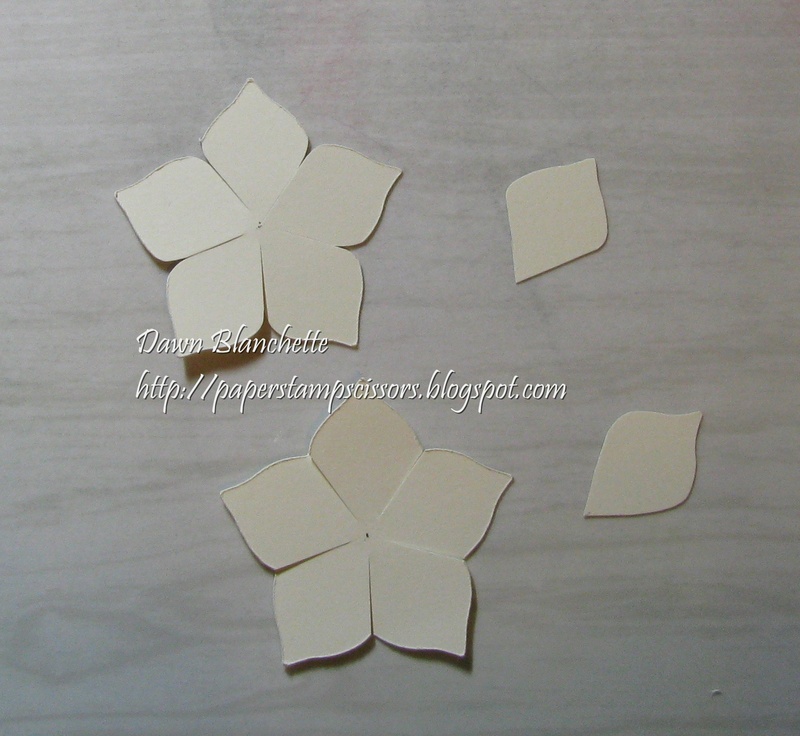 Mark the centre of each flower with a small dot and cut the petals deeper toward the centre as shown. Cut all the way down to the centre line with one of you cuts only - this is where you will sneak in that extra petal. On the spare flower, completely remove one petal. I coloured my daffodils with Distress scattered straw. Obviously skip this step if your paper is already the colour you want it. Gently mist the flowers with water from a spray bottle. They should be damp, but not saturated. 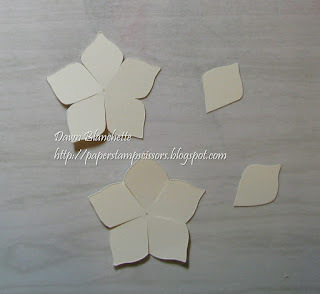 Carefully fold each petal accordian style, but don't try to be too perfect. Gently unfold, leaving substantial creasing. Twist petals slightly as desired. Allow to dry (should not take very long, but you can use a heat tool if you like). 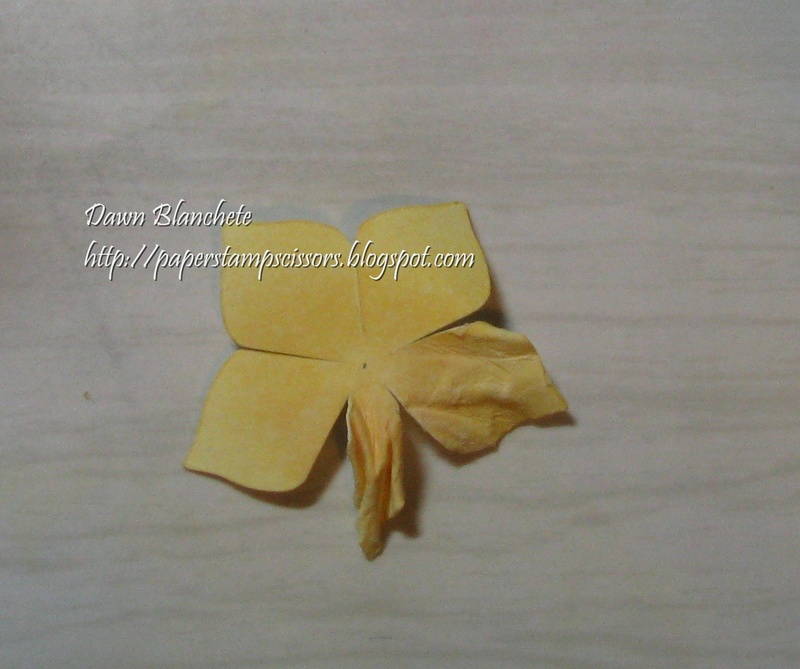 Once dry, glue the extra petal at the centre of the flower. It should look like the one pictured below. 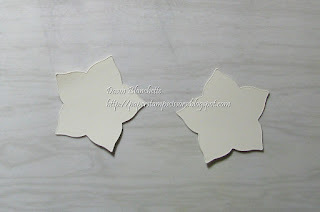 Next cut a small strip of paper to create the centre. Don't worry too much about getting the size perfect right away; it can be trimmed as you go. I used Fiskars ripple scissors along the top edge for a ripply effect. Pinking scissors would work as well or you can leave it straight. Colour and gently mist with water as in steps above. This next part is very tricky - Carefully roll the top edge back and curl the length into a cylinder. 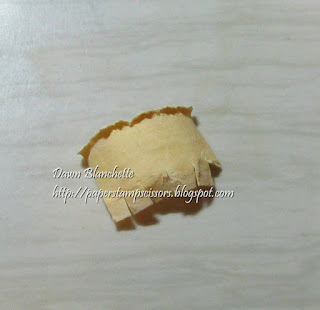 This will have to be done gradually in alternating steps to avoid tearing the paper. Once you are satisfied, trim the length and/or width as needed. I made my centres long enough to slightly overlap when rolled around the end of a pencil, but larger flowers will need larger centres. 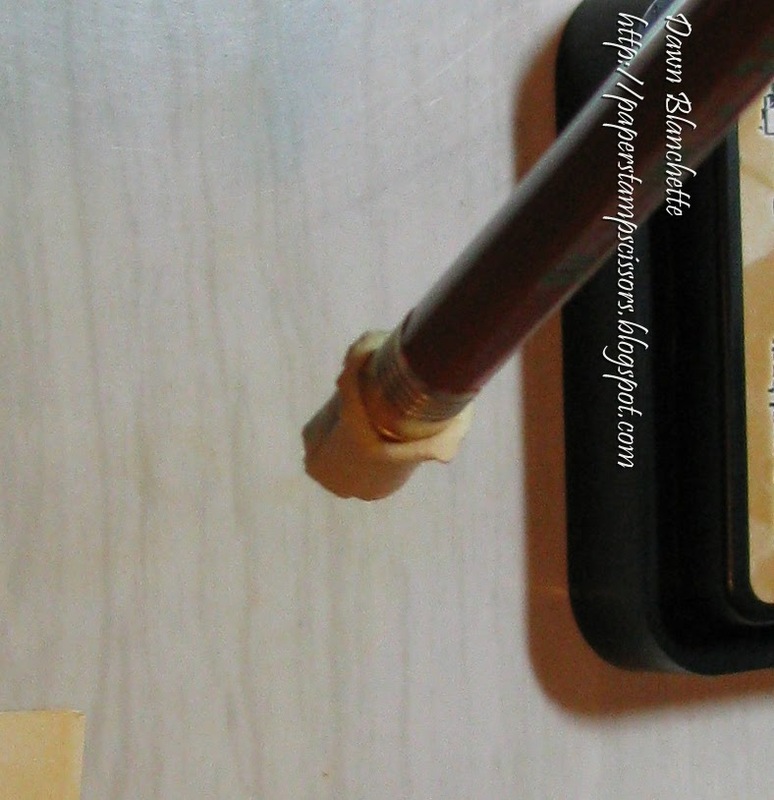 When trimming the height, leave them slightly longer than needed to allow the bottom to be folded in and glued. Cut small strips as shown for easier folding. Thanks for stopping in! I hope you have enjoyed my card and tutorial. If you have questions, please feel free to leave a comment or e-mail. 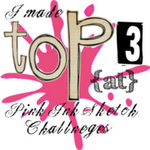 I would love to see your daffodil creations, so please leave me a link to your projects. And finally, thanks for taking the time to leave a comment - I appreciate each one of them and love to visit you back! Enjoy the rest of your week! Hi Dawn, love your card and the layers. I adore your daffodil tutoria. 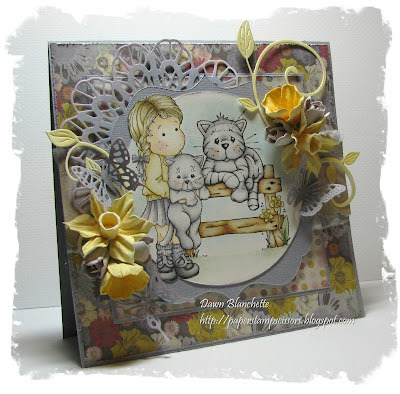 Best of luck with the DT call for Cheery Lynn Designs and thanks so much for taking part in this weeks challenge. Dawn, I love your card and tutorial. Love those colours. 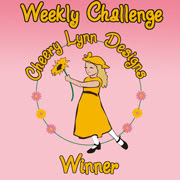 Good luck in the Cheery Lynn designs challenge. What a delightful card. I love your flowers!! Beautiful card with wonderful arrangement. Very nice tutorial and great job on your coloring too! Beautful card Dawn with very nice colours and beautifyl flowers. Thanks for sharing how to make the daffodils. Awww!!! Soooo cute!!!! Fabulous tutorial!! 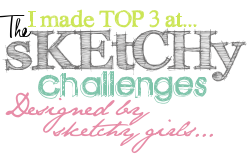 Good luck and thanks for playing along at Cheery Lynn Designs!